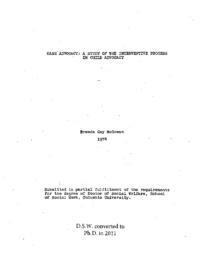 This is an exploratory study of the practice of case advocacy on behalf of children. The objectives of the study were to identify and classify the major components of case advocacy, to generate hypotheses describing the basic dynamics of this process, and to analyze the implications of these findings for the theory and practice of advocacy. The study was carried out during 1972-1973. Data were collected from 39 practitioners of child advocacy who had varying levels of education and work experience and were employed in eight different types of agencies located throughout the country. The respondents submitted 163 incidents of case advocacy over a five-month data collection period. The critical incident technique was the primary research instrument. Respondents were asked to submit brief written questionnaires describing the first incident of case advocacy they engaged in each week. Data collected in this manner were supplemented by site visits to each of the sample agencies, background information questionnaires on the respondents, and findings from a baseline study of child advocacy. The incidents were analyzed in an inductive manner to identify the major components of case advocacy and to develop a classification scheme delineating these variables. The incidents were then coded by the conference method so that frequencies and associations among variables could be computed. Finally, these findings were analyzed to generate hypotheses describing the major dynamics of the advocacy process. Case advocacy was revealed in this study as a complex, dynamic process in which there are a number of interrelated variables. To describe this process briefly, the study identified five major modes of direct intervention in child advocacy: intercession, persuasion, negotiation, pressure, and coercion. In addition, it was noted that indirect modes of influence are employed frequently. The advocate's use of one or more of these modes of intervention is determined by his analysis of the problem, objective and sanction for the intervention; his resources; and the receptivity of the target system. These variables also influence his decision as to the level and object of his intervention. It appears, however, that there is constant interaction and feedback among these components of the advocacy process so that the change agent constantly reassesses his approach in relation to his changing understanding of these various factors. And after the initial intervention has been completed, the advocate's evaluation of the outcome influences his decision as to whether to terminate his activity, adopt a different strategy, or initiate additional advocacy. It was noted that the advocates were reluctant to employ adversarial techniques, making extensive use of collaborative and mediatory strategies. Also, the respondents tended to employ a rather limited interventive repertoire and to engage in a relatively low level of intervention. The change agent and the target system appeared to be the primary determinants of the advocacy process. However, it was noted that the stronger the sanction for a particular intervention, the more options the advocate had in regard to object, level, and method of intervention. Although there was no conclusive evidence, it seemed that the resources of the change agent and the receptivity of the target system were the primary factors related to outcome. The findings have implications for the organization and practice of child advocacy. Also, it is hoped that the conceptual framework presented here will contribute to the development of a theory of advocacy practice.